The Short Version: Oklahoma City is quickly becoming known throughout its region as a tourist destination, offering everything visitors should expect from a major metropolitan city — fine dining, nightlife, and top-rated hotels. At the city’s cultural center lies the Oklahoma City Museum of Art (OKCMOA). Drawing more than 125,000 people from around the world each year, the museum houses an extensive collection of visual art, rotating exhibitions, film screenings, and educational resources for art lovers. 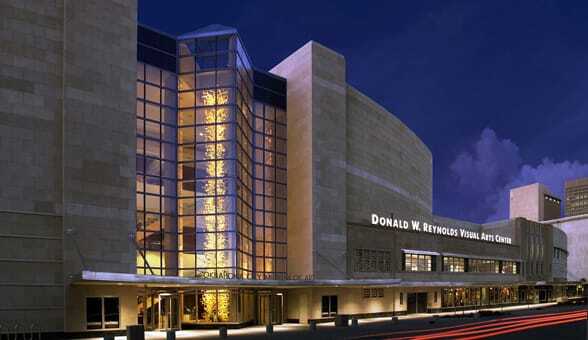 By holding frequent events as well as special openings, OKCMOA provides a central location for people to come together to experience and enjoy diverse types of art. The Museum welcomes visitors and natives alike with innovative and engaging activities that bring the joy of art to every age group and experience level. For many outsiders, mentions of Oklahoma City bring to mind visions of the Old West. The state capital lies in a region popularly known as Frontier Country — and for good reason. The city is situated in the middle of what was once the entry point into adventure on the high plains, providing cowboys and homesteaders a corridor into Texas, New Mexico, and beyond. Though cowboys and stockyards still abound in what is referred to as the “Horse Show Capital of the World,” locals know Oklahoma City as a cultural hub that attracts visitors from around the world to experience nightlife, outdoor recreation, and world-class cuisine. At the heart of the city’s cultural offerings is the Oklahoma City Museum of Art (OKCMOA). The OKCMOA is the cultural center of Oklahoma City, attracting more than 125,000 visitors annually. The museum houses a large-scale collection of visual art, rotating exhibitions, film screenings, and educational resources that have more than 125,000 art admirers walking through their doors each year. Their programs and events also provide venues for like-minded people to bond and discuss art and culture. Opening nights, such as one for 19th-century Japanese woodblock prints, and educational courses, such as glass-blowing and photography, encourage learning and connecting. Visited by over 125,000 visitors annually, the OKCMOA is a hub of artistic activity. The combination of two separate institutions, the Oklahoma Art Center and the Oklahoma Museum of Art, the OKCMOA came into being in 1989 as a response to a depressed economy and the desire to have one extraordinary single entity rather than two underfunded sites. Thanks to a grant from the Donald W. Reynolds Foundation and other generous donors, the museum’s impressive collection covers five centuries with special highlights in European and American art spanning through the 19th and 21st century. It also hosts a growing collection of contemporary art and one of the world’s largest collections of glass sculptures by Dale Chihuly. The OKCMOA hosts rich arts programs where people can come together to share knowledge and learn. The OKCMOA expands on art appreciation with both a museum school and an art-house style theater. These additions make the museum more than a gallery but an interactive part of the community. This expansive site allows visitors to mix and mingle with film buffs on Fridays and then enjoy a glass-blowing class on Saturday mornings. 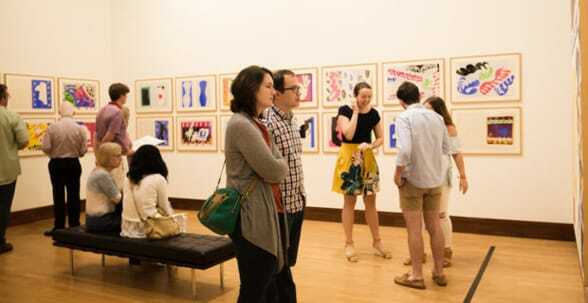 OKCMOA not only houses art but inspires guests to absorb and participate in a fully dimensional way. Another visitor who gave the museum high ratings, Linh S., even remarked on how the OKCMOA brought together a couple during one of their more festive Thursday events. In addition to having a permanent collection, the Oklahoma City Museum of Art also hosts three to four exhibitions every year on the first floor. OKCMOA takes pride in their diverse offerings, which include everything from ancient Egyptian to French Impressionists and beyond. Visitors can meet fellow history buffs at The Complete WPA Collection, which incorporates the artists discovered by the Roosevelt’s New Deal Federal Art Project. This collection features rural American landscapes and takes you back in time with paintings of labor and industrial development. Enjoy lively conversation with a discussion of the viewpoint of Russian immigrant painters who are featured in this rotating exhibit. Dale Chihuly’s Magic and Light exhibit features a three-dimensional viewing opportunity. Visitors can view the large Float Boat piece and others from all sides. It includes other breathtaking pieces such as the 55-foot Eleanor Blake Kirkpatrick Memorial Tower (2002), numerous collections of cylinders and baskets, as well as some of his drawings. This exhibit is one of the world’s largest collections of blown-glass. OCKMOA’s exhibits are well-attended and provide venues for like-minded people to mingle. Events, such as the museum’s Evening of Art and Performance, attract big crowds and provide new date ideas and opportunities to interact with new people. Attendees can enjoy drinks and refreshments as they mingle with other artsy folks. Several live performances of music, dance, and poetry are presented in the gallery, which can make for an exciting and conversation-starting experience. 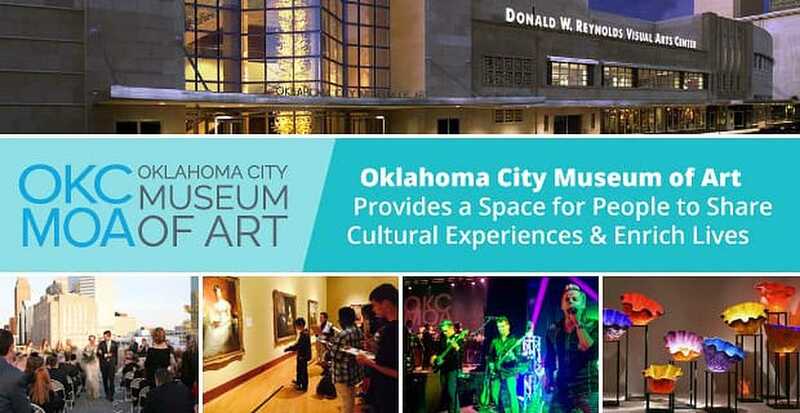 Another regular event where you are sure to encounter compatible art lovers and have a great time is OKCMOA’s Art After 5, a time to visit the museum in the evening for only $5. Not only can you visit the galleries, but there is also a film screening in the theater and yoga classes available for an additional fee. As an added bonus for those wanting to extend conversations on the arts, visitors can present museum tickets at Mary Eddy’s Kitchen x Lounge at the 21C Museum Hotel and receive a $5 cocktail. Turn Thursday night into a cultural experience where you can rub elbows with people who share your interests. Adult classes cover everything from printmaking to glassmaking and yoga. Glass-blowing is one of the most popular courses at the Museum School and is frequently sold out. Get on the list as soon as possible, and you can start out by making your first paperweight as you learn the movement of the class and how to shape it. The Museum School offers numerous educational opportunities such as glass-blowing and yoga classes. Students can continue enjoying the fluid movements and calming experience of glass-blowing with other, more advanced classes after completing an introductory class. If you’re looking for a different type of stress relief, drop-in yoga classes grant an inspiring practice within the gallery walls. The Museum School also holds Family Workshops which allows families to learn, create, and socialize with other households. Families can make their own sculptures inspired by Chihuly in the Chihuly Sculpture Class. Future jewelry designers can enjoy a little Mommy (or Daddy) and me time in Shrinky Dinks Jewelry, here students will browse the galleries for inspiration, draw, and add their designs to earrings, necklaces, and bracelets. Single parents can bond at these workshops over a shared commitment to bring art into their children’s lives. The museum houses a repertory cinema, the Samuel Roberts Nobel Theater, which screens international and independent films as well as classics. The theater consciously curates an art-house feel with intimate seating and cinematic selections. 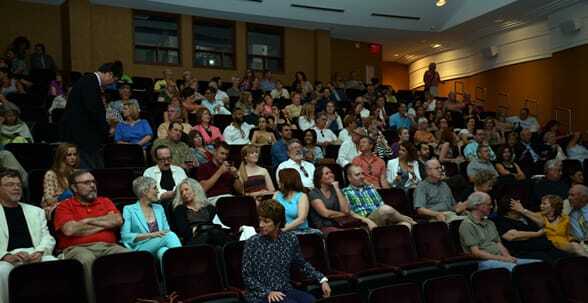 The museum’s film program hosts a wide array of screenings Thursday through Sunday. In addition to their regular showings, the theater is currently featuring all of the 2017 Oscar-nominated short films in the Animation, Documentary, and Live Action categories, so you can catch them prior to the award show. Drop by to join the conversation on the Oscar-worthy and the Oscar-not-so-worthy. At Dinner and a Movie nights, visitors can grab a bite in the café and catch a film in the theater. A Dinner and a Movie package is also available in conjunction with the Museum Café, making for an elegant and affordable date night. Enjoy dinner with a chef-designed two-course Prix-Fixe meal, and then watch a movie afterward. This is an excellent way to surprise your special someone or impress a new friend with a new turn on a classic date night. Though 10-gallon hats and cowboy boots are still staples of the homesteading culture that founded the city, it’s clear Oklahoma City has grown to represent more than just the Old West. Institutions, such as the OKCMOA, have turned the city into a destination that draws people from all walks of life. Those who enjoyed their experiences at OKCMOA and wish to contribute to the museum can give back in a volunteer capacity. There are opportunities to volunteer as a Docent to learn and educate others about the museum’s permanent and visiting exhibitions. Art enthusiasts can attend a fundraising event, in both casual and black-tie varieties, to meet other like-minded patrons who believe art has a unique role in understanding and embracing diverse cultures and communities. No matter if you’re a sculpture enthusiast or a cinephile, OKCMOA offers a wide range of ways to interact with art and connect with others who share your same passion.